Although a few years older than me, and the fact that we never met, until I had him sign his book at a public event, I feel somehow I know Duncan Hannah. I first discovered his artwork through Dennis Cooper's fantastic blog, and his paintings just spoke to me directly. First of all, I have a thing for illustrations from the mid-century, especially drawings from the various titles of the Hardy Boys, and somehow Hannah's work reminds me of that type of work. But done on a plane that's serious art but still humorous. In that blog I saw various photographs of Hannah, and it struck me as a dandy who lived in harsh circumstances, yet, kept his chin up and his hair marvelously cut. His sense of style and some of the artwork reminded me of this dandy art duo David McDermott and Peter McGough, who not only dressed from the past but also their artwork went back to the 1920s or even earlier. But their work has a contemporary edge, just like Hannah's paintings. I should have been surprised, but reading Hannah's book, he was or is a friend of McDermott. Still, this is not imitation, but the meeting of the minds at work here. Hannah was born straight and foppish. It's in his nature and this is why his notebooks of the crazed 1970s in New York City is so thrilling. In essence, he has character, or I should say, if I were a movie producer, he has that "It" quality. The reason why I feel like I know or should know him is that it's uncanny we have the same taste in literature and music. I know, because he lists all his listening and reading material on a regular basis in this book. Which is not tedious to read, but essential to know, because his taste is very much what is Duncan Hannah. The fact he paints portraits of his literary and cinematic heroes is another self-expression. I suspect that these works are self-portraits more than anything else. And I say that not as a criticism, but as praise. 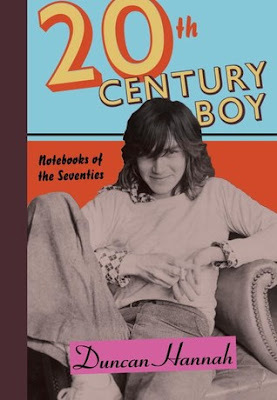 "Twentieth-Century Boy" is Hannah's journal, and it's not a memoir. It reads like one is experiencing these adventures at the instant it happened, and his reflection is only seconds or hours after the incident. Sexual in nature, and always curious about an adventure, Hannah from the very beginning had or still has high standards. His sexual fun is enticing, and a joy to read, but also his encounters with the great from Bryan Ferry to Bowie to Dali to Warhol to Debbie Harry, and beyond, to the various artists who lived and operated in Lower Manhattan during that era are excellent co-stars in his book. What's surprising is that he very much led the life of a desperate alcoholic, yet, by his photographs, he didn't look drunk. He was always well-dressed and has an exceptional self-awareness. Perhaps he's blessed. Nevertheless, he's a hero of mine. I don't have a brother, but in my head, he's the older brother to look up to. Praise Duncan Hannah and his book "Twentieth-Century Boy."